If you’re ever in Chicago, give serious consideration to stopping by Beatrix, a River North (really, downtown to me) restaurant that’s so many things: coffee bar, real bar, bakery and breakfast/lunch/dinner place. A lot of the food has a modern, healthy spin and all the trends are here, including a delicious crispy kale salad. This gluten-free, triple chocolate chunk cookie is seriously to die for. I split one with two friends when I was in Chicago last month, and when I had a quick return trip to give a talk last week, I had to swing by for another. Except this time, that cookie was all mine. I’d love to find the recipe. 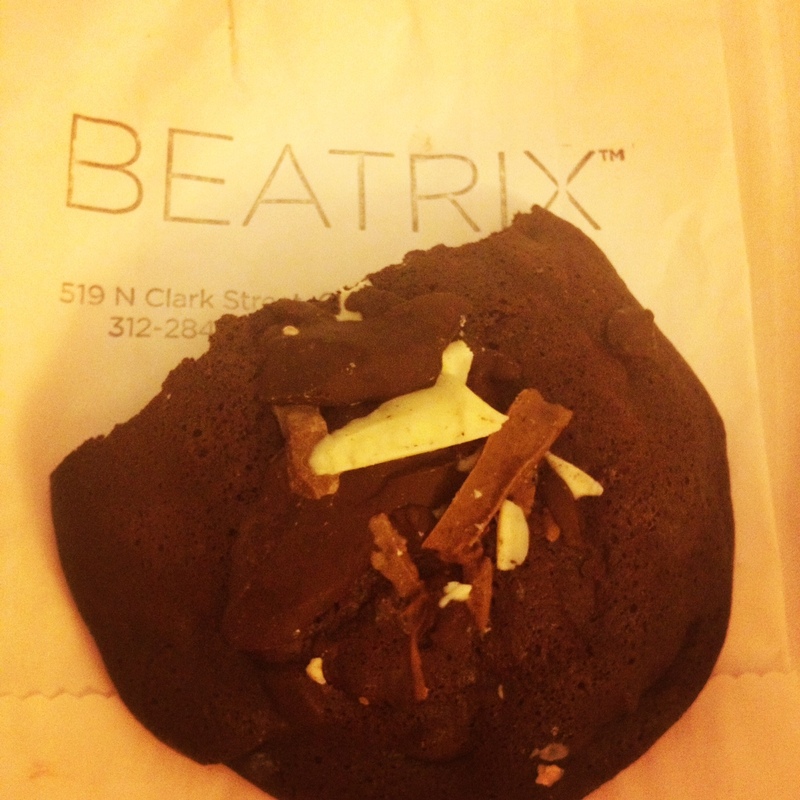 (Correction: I’d love to live next door to Beatrix and go there every day for one of these babies. My legendary hatred of all domestic chores persists). I don’t even know what dark treacle is. This version from gluten-free guru Bob’s Red Mill seems much easier by comparison, but it still involves baking and this is me we’re talking about here. I’ll probably be content to dream about that cookie (and book a return ticket to Chicago for next month). A few years ago, my friend J recommended “The Devil in the White City” by Erik Larson. We were both attending our friend S’s wedding in Chicago, and J mentioned that this book was a true story about the 1893 Chicago World’s Fair and a serial killer operating under the guise of a doctor during that era. Although I downloaded the book right away (lest I forget), I didn’t get around to starting it until my trip to Chicago earlier this week. Wow! What a page turner. Although I usually don’t get into true crime or historical non-fiction books, this one is gripping. P.S. More about the Chicago World’s Fair.